Dear Student, I hope you are fine. We are starting a “Test Series Program” for Matric 9th & 10th, 1st Year & 2nd Year Students who are appearing in their final Exams in 2018 from 1st January to 28th February. The purpose of this “Test series” is to prepare students for their final, boards exams. By the grace of Almighty Allah every year our students achieve top positions in their respective boards and InshaAllah this tradition will be maintained in coming years as well. The Salient features of the course are. 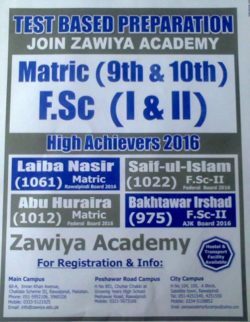 For further details & registration kindly contact our office.